The night of Saturday 8 February 2014 will always be remembered by me. It was the night when locally and internationally renowned Playwright Richardo Keens–Douglas did an excellent exposition of his play “Uncle” at the Grenada Trade Centre to a packed audience. 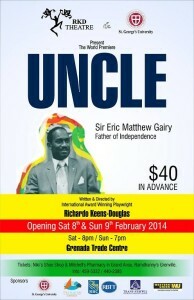 The play traced the life and times of Sir Eric Mathew Gairy who is hailed as being the Father of Grenada’s Independence. As we are in the midst of celebrating forty years of independence, the portrayal was most timely and is a perfect example of how history may be learnt through theatre. The song “Island in the Sun” introduced the opening scene. That rendition must have given a gentle reminder to many in the audience that Grenada was once the main location for the shooting of the film of the same name. It was done in 1957 and was a major box office success. The film had popular movie stars such as James Mason, Michael Rennie, Joan Collins, Dorothy Dandridge, Stephen Boyd and the singer of the song himself Harry Belafonte. Perhaps Grenada ought to capitalize more on this part of our history for the benefit of our tourism product. The first scene of the play began with a group of Grenadians enjoying the independence holiday by having a picnic on top of a hill. Whilst there, they reminisced about Grenada’s difficult journey to independence. Inevitably they had to discuss the life of Grenada’s first Prime Minister “Uncle Gairy”. We were reminded that Gairy was born in the village of Dunfermline in the parish of Saint Andrew and attended the La Fillette Primary School. At a very young age he gave a sermon in one of the Roman Catholic Churches in St. Andrew’s parish where he was an acolyte. He then went to Trinidad where he worked for sometime and then to Aruba. In Aruba he was involved in the trade union movement which participation prepared him for his later involvement in enhancing the livelihood of plantation workers after his return to Grenada in 1949. 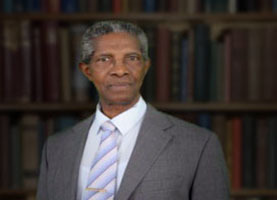 In 1951, as trade union leader of the Grenada Manual Mental and Intellectual Workers’ Union, he spearheaded a general strike throughout many agricultural estates and subsequently managed to obtain many benefits for agricultural workers. Gairy then used this trade union base for launching his political party, the Grenada United Labour Party after which he struggled with the then colonial powers in order to have more local control of the country by local politicians. As Premier, he proved to be a visionary and innovator when he introduced to Grenada, a number of pre-primary schools which system still continues today, a number of roundabouts which enhance the smooth flow of traffic, and encouraged the establishment of St. George’s University, which institution significantly enhances the economy of the country. Ultimately, despite his controversial tactics by the use of his “Mongoose Gang”, he gained independence for Grenada on 7 February 1974. In order to bring out this part of our history, the Playwright skilfully and professionally interwoven snippets of Gairy’s historic past by way of multi-tasking his limited number of actors to portray different roles. On occasions, Gairy himself was exquisitely played by Randal Robinson who adequately depicted the many moods of Gairy: his exuberance when talking to the crowds; his dogmatism when talking to his advisors and his internal struggle as a human being when he realised that his back was against the wall with the persistent antagonism of the New Jewel Movement. Playwright Keens–Douglas himself gave a most impressive image of Gairy with his hallmark white three-piece suite, white shoes and walking stick. Indeed Gairy was always a well-dressed person, and had an excellent command of the Queen’s English. His short-cropped black wavy hair consistently enhanced his handsome personality. It was quite recognisable that Keens–Douglas had some difficulty in depicting the hair characteristic. Jomo Kirton multi-tasked by portraying, among other roles, a plantation worker, a plantation owner and the revolutionary, Maurice Bishop. His performances are highly commendable. Nevon Butler, especially in his acting as one of Gairy’s advisers, Neila Ettienne, (especially for her clarity) Zoe Hagley (especially for her clarity), Kenril Charles, Dorage Charles and Kishawn Thomas gave commendable performances. Just as the play, “Redemption Time” which was recently done by Plawright Francis Urias Peters gave us a historical perspective of the final period of governance under Gairy and the rise and fall of the People’s Revolutionary Government, so does this present play “Uncle” play its own part in teaching us our history. Well done Richardo! Well done!